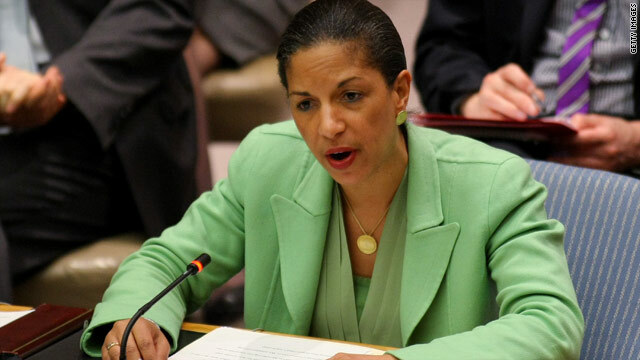 Washington (CNN) - Several senior administration officials tell CNN UN Ambassador Susan Rice's use of the word "spontaneous" on Sunday talk shows five days after the Libya incident came directly from an assessment provided to the House intelligence community by the CIA, which was not edited by the White House. The officials maintain the criticism is a result of a poor word choice rather than a true difference in representing what was known about the attack at the time. Several officials say instead of calling it "spontaneous" - it might have been better phrased as: the attack had not been long planned; or there were no signs of an upcoming attack on September 11th. One administration official suggests there's a translation challenge when it comes to the language intelligence professionals use. In late September, DNI spokesman Shawn Turner said: "As we learned more about the attack we revised our initial assessment to reflect new information indicating that it was a deliberate and organized terrorist attack carried out by extremists." This official says in that statement, "deliberate" should be understood to mean the militants had "a willful intent to get over the compound." The official said use of the word "organized" should be interpreted to mean "the people involved in the attack knew each other, they weren't meeting there for the first time." Another administration official asserts that, as the intelligence community has continued scrubbing the intelligence, they find no reference to a pending attack on September 11th. This official says that's why they argued there was no premeditation. With regard to the initial thinking that the incident started as a protest – this official maintains that intelligence coming from human sources and intercepts all indicated there was a protest on the scene. They note that there were many across the Middle East at the time as well as confusion in the immediate aftermath of the attack. Since then, senior State Department officials have said there was "nothing unusual" throughout the day of the attack and that the first sign of a problem came at 9:40 p.m. when diplomatic security agents heard loud talking outside the compound, along with gunfire and explosions. Somebody sent the parrot, Rice, out and muscled all five of appearences on Sunday morning shows. Who might have forced her to do that debacle? Who really cares WHAT it was called. People died and the GOP is trying to score cheap political points off our dead ambassador's body. This went way beyond a "word choice." it is a full-blown cover-up ! "it is a full-blown cover-up !" "Cover-up" should be understood mean "a protest on the scene." No matter how one "slices" or "dices" it. We've been at war against Terrorists since 2001. Why, then, is this concept we were surprise attacked during a time of War supposedly aligned with the assumption of mismanagement at the White House by the GOP??? I understand a GOP's politicizing this during an election year. But make no mistake about it..... this makes for a political miscalculation on their part during time of war because a surprise attack by the enemy only brings empathy for unity.....not dissent. Through Romnesia......Mitt doesn't even gave his facts straight about what happened. Republicans are stupid! SHAMEFUL that after all of this time (more than 1 month) that the President and his sockpuppets STILL refuse to call it what it was ...A TERRORIST ATTACK! The people there in the compound started videotaping the incident and had a LIVE feed to Washington reporting that they were under ATTACK! Prior to that there were no protestors there. We now know that the (2) SEALS who were killed rushed to the Embassy from another part of town, who took up arms to help evacuate (20) other people there, fighting for over (2) hours against an estimated 200 militants, who finally killed them in a 2nd wave of attacks with RPG's and a anti-aircraft gun! So how is this the fault of the GOP? And how are they trying to score political points? WE AS AMERICANS should want to know WHY in the Hell this happened! This is a COVERUP! Why are we bickering over if it was or wasn't planned or wording if he called it a " act of terror " or not, it happened end of story. I'm sure some drones will be sent out to be used as payback since that's what happens A LOT now so why are we politicizing this into who wins the election. To say its a full blown cover up is a bit off when usually were invading countries and covering it up. I don't know .....one seems very pathetic to attack since the ones attacking were defending the other, especially over bad intelligence and or wording. It WAS a spontanous protest.., I heard it hundreds of times, even from Obama himself. right?? Since that is all the twit and lyan altar boy have left to go after the President why don't they send that tagg (mr boxer from afar) to see if he can find out the truth. Right, I forgot, he is as much of a yellow bellied coward like his bully bishop dad. If it wasn't so tragic it would be hallarious watching Obama's team try and blame this on anyone but Obama when it is obvious to anyone with an IQ over 0 that it is 100% Obama's fault. Obama wants you to know that he will FIX it. It was his responsibility to prevent it in the first place. Given this, the real fix is to get Obama out of the White House. The attempt by the Romney campaign, and by all his little furry-legged locked-step minions out here, to take political advantage of a national crisis and American deaths, even as the threat was continuing and accurate information about the incident was still being analysed, is absolutely DEPLORABLE. I dare any one of you tailless monkeys to attempt to talk to me about this out on the street. Your Talibani tactics are unpatriotic and morally reprehensible. Cover-ups, secrets.......to what end? Just how would ANYONE benefit from these things, even if they were true?!! Its all a made-up fantasy for cheap political benefit....it rocks the world for all those tin-foil-hat Teatards who haven't had a run-in with the real world in years. Just utter nonsense, and frankly such emptyheaded loud-mouthed ignorants are an embarrassment to this country. texas would know a great deal about parrots. They have loads of slack-jaws and binary-toothers that parrot the rightwing noise machine, obediantly doing the bidding of their media lords. ancient has shown repeatedly that he has nothing to say of any meaning to a sentient humans. That is why he considers himself popular with the Teatards. The only confusion in the days following sept.11 is which video were they gonna find on YouTube to blame. This story tells us that the word "spontaneous" came straight from a CIA briefing paper. It was not a word intended by Rice or the administration to "cover up" what had actually taken place. Lest we forget, there were demonstrations throughout the Arab world pertaining to the video.......it was reasonable to assume the video also played a role in what happened at Bengazi. There was no indication at that time that this event had been pre-planned. After a thorough investigation (that is still ongoing), we now know much more about the event and that information has been shared with us by the administration. So where is this "cover up" that some of you keep harping on? A coverup is defined as an effort to "hide from view or knowledge," as in "Richard Nixon tried to cover up the fact that he ordered the break-in at the offices of the Democratic National Committee." No one is trying to hide the fact that four Americans were killed by a mob in Benghazi. We are arguing about what to call an incident that all acknowledge occured. Whether the Benghazi assault is called a terrorist incident perpetrated by right-wing Muslim terrorists or a spontaneous riot inspired by a right-wing video is a disagreement over terms, not an effort to coverup the incident. The Administration released information as the information came in from the field. There are those in government who argue that raw information of this type should not be released until a considered judgment of the validity and accuracy of the information can be assessed. There are others who believe information should be release immediately. There are good and bad points for both views. Why not ratchet down the volume a little? This still just amazes me at the Bagger Party. Ryan during his failed debate complained that the POTUS did not call it a terrorist attack for a couple of weeks. He said they would call it as they see it, in other words, forget the facts or waiting till we have all the info we'll hang them first and then have a trial. Now they are playing a semantics game about what the POTUS did say the day after in the Rose Garden and screaming he was talking about 9-11 and all I can say is.........WHAT A GREAT GUY THIS PRESIDENT IS! He took all these right wing hillbillys to lunch the same day and told them exactly what was on his mind. MittWitt however will never have to take the liberals to lunch. He says exactly what he means.........it just changes from hour to hour.